Semiconductor nanomechanical oscillators enable the pursuit of new physical phenomenon that can only be observed through the tiny mechanical displacement as well as enabling the development of nanoscience and nanotechnology. These systems with sharp mechanical resonances can be manipulated by electrical or optical means permitting a wide range of applications such as metrology and information processing . Coupling two such nanomechanical oscillators has recently emerged as a subject of interest. This is because the sympathetic oscillation dynamics in the coupled system expand the potential applications of nanomechanical objects such as highly precise sensors, high-Q band-pass filters, signal amplifier, and even logic gates [2-5]. However, an obstacle to the further development of this architecture arises from the usually weak elastic (or electric) coupling between the nanomechanical components. This limits the ability to coherently transfer the vibration energy between the oscillators within the oscillator’s ring-down time. In other words, the coherent manipulation of the vibrational states, e.g., Rabi cycle and Ramsey fringe as in two-level quantum systems , is highly challenging in this coupled phonon system. 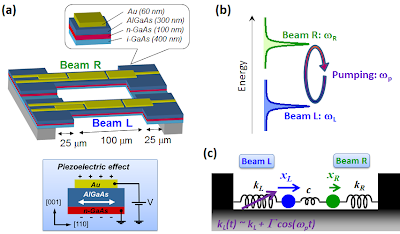 In our recent publication , we demonstrated coherent coupling of nanomechanical oscillators. This was realized in two geometrically interconnected GaAs doubly-clamped beams [Fig. 1(a)], where the frequency of beam R is higher than that of beam L as shown in Fig. 1(b). Because of the frequency mismatch and the weak mechanical coupling, coherent energy exchange between the two beams is not possible by the geometric interconnection alone. Figure 1. (a) Schematic drawing of the sample and the piezoelectric effect. The piezoelectric effect enables harmonic driving, pumping, and detection of the mechanical motion via gate voltage. (b) Schematic drawing of the mechanical resonance for beam L and beam R. The frequency of beam R is higher than that of beam L (293.93 kHz) by 440 Hz. The coherent energy exchange between the two beams is achieved by applying the pumping voltage to beam L with the frequency difference between the two beams. (c) Schematic of the pumping protocol in a mass and spring model. 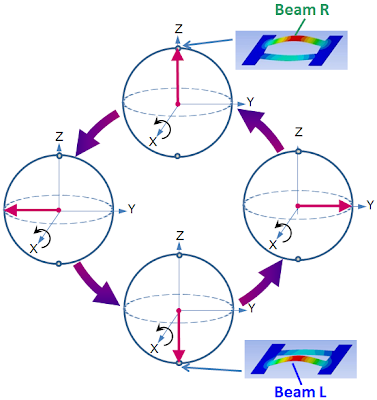 Coherent energy exchange can be achieved by dynamically coupling the mechanical oscillations of the two beams. This is realized by periodically modulating the spring constant of one beam at the frequency difference between the two beams [Fig. 1(c)]. This periodic modulation, namely pumping, can be induced by applying gate voltage via the piezoelectric effect in this sample [Fig. 1(a)]. This pumping enables strong vibrational coupling, leading to the cyclic (Rabi) oscillations between the two vibrational states (the beam-L state and the beam-R state) on the Bloch sphere (Fig. 2). The Rabi cycle period, i.e., the coupling strength, is fully adjustable by changing the pump amplitude via the gate voltage. As a result, the vibration energy can be quickly transferred from one beam to the other enabling the vibration of the original beam to be switched off on a time-scale orders of magnitude shorter than its ring-down time. This quick energy transfer to the adjacent oscillator opens up the prospect of high-speed repetitive operations for sensors and logics using nanomechanical systems [8,9]. Figure 2. Schematic drawing showing the evolution of the coupled mechanical oscillators on the Bloch sphere when undergoing a Rabi cycle. In terms of phonon populations, the present system with sub-megahertz frequency is still in the classical regime with large mode occupation. However, the above technique could also be extended to gigahertz frequency mechanical oscillators in which the average phonon number in the mechanical modes falls below one at cryogenic temperatures . This in turn leads to the exciting possibility of phononic quantum bits and entanglement between distinct macroscopic mechanical elements . A. N. Cleland, “Foundations of Nanomechanics” (Springer-Verlag Berlin Heidelberg New York, 2003). Matthew Spletzer, Arvind Raman, Alexander Q. Wu, Xianfan Xu, Ron Reifenberger, “Ultrasensitive mass sensing using mode localization in coupled microcantilevers”, Applied Physics Letters, 88, 254102 (2006). Abstract. F. D. Bannon, J. R. Clark, and C. T.-C. Nguyen, “High-Q HF microelectromechanical filters”, IEEE J. Solid-State Circuits 35, 512-526 (2000). Abstract. R. B. Karabalin, Ron Lifshitz, M. C. Cross, M. H. Matheny, S. C. Masmanidis, and M. L. Roukes, “Signal amplification by sensitive control of bifurcation topology”, Physical Review Letters, 106, 094102 (2011). Abstract. Sotiris C. Masmanidis, Rassul B. Karabalin, Iwijn De Vlaminck, Gustaaf Borghs, Mark R. Freeman, Michael L. Roukes, “Multifunctional nanomechanical systems via tunably coupled piezoelectric actuation”, Science, 317, 780-783 (2007). Abstract. J. R. Petta, A. C. Johnson, J. M. Taylor, E. A. Laird, A. Yacoby, M. D. Lukin, C. M. Marcus, M. P. Hanson, A. C. Gossard, “Coherent manipulation of coupled electron spins in semiconductor quantum dots”, Science, 309, 2180-2184 (2005). Abstract. Hajime Okamoto, Adrien Gourgout, Chia-Yuan Chang, Koji Onomitsu, Imran Mahboob, Edward Yi Chang, Hiroshi Yamaguchi, “Coherent phonon manipulation in coupled mechanical resonators”, Nature Physics, 9, 480-484 (2013). Abstract. Hiroshi Yamaguchi, Hajime Okamoto, and Imran Mahboob, “Coherent control of micro/nanomechanical oscillation using parametric mode mixing”, Applied Physics Express, 5, 014001 (2012). Abstract. I. Mahboob, E. Flurin, K. Nishiguchi, A. Fujiwara, H. Yamaguchi, “Interconnect-free parallel logic circuits in a single mechanical resonator”, Nature Communications, 2, 198 (2011). Abstract. A. D. O’Connell, M. Hofheinz, M. Ansmann, Radoslaw C. Bialczak, M. Lenander, Erik Lucero, M. Neeley, D. Sank, H. Wang, M. Weides, J. Wenner, John M. Martinis, A. N. Cleland, “Quantum ground state and single-phonon control of a mechanical resonator”, Nature, 464, 697-703 (2010). Abstract. Simon Rips and Michael J. Hartmann, “Quantum information processing with nanomechanical qubits”, Physical Review Letters, 110, 120503 (2013). Abstract.